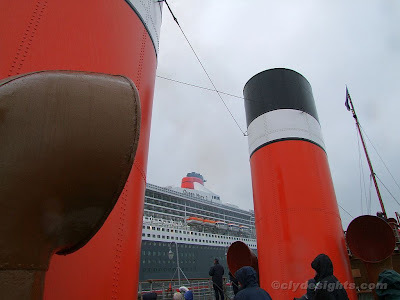 Framed by WAVERLEY'S twin red, white and black funnels, QUEEN MARY 2's funnel presents a contrasting appearance. While the liner's funnel was originally intended to have the appearance of that fitted to QUEEN ELIZABETH 2, it underwent an alteration during the design proceess. This resulted in it having a squatter appearance, and was to allow it to fit below the Verrazano-Narrows Bridge in New York, which she clears by just 13 feet at high water. Also visible in this picture are some of her numerous lifeboats and tenders. These are fitted higher than on most ships after it was conceded that to place them at a lower level could result in possible damage in the North Atlantic in winter.